Most readers will appreciate that there is still much for us to learn about our world and the other creatures that call it home. This is regularly highlighted by the discovery of new and remarkable species and even entire new ecosystems in less accessible parts of the world. New discoveries, however, also happen close to home. In the forested headwaters of the inland flowing Cudgegong River in Coricudgy State Forest, below basalt-capped Mt Coricudgy, a giant, stream-dwelling, burrowing, spiny crayfish species, Euastacus vesper, closely related to Euastacus spinifer of eastern drainages, has recently been described by freshwater crayfish researchers, Rob McCormack and Shane Ahjong1. 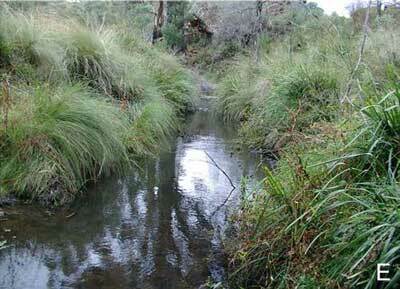 The species was recorded from two small streams just west of the watershed of the Great Dividing Range. According to Rob McCormack the conservation status of this species is probably Critically Endangered2. The discovery of this apparently highly-localised species provides further evidence of the high conservation value of Coricudgy State Forest and of the opportunities for further research in this area3. Coricudgy State Forest adjoins Wollemi National Park, part of the Greater Blue Mountains World Heritage Area, and has been proposed for National Heritage listing. Such listing is a prerequisite for nomination for addition to the World Heritage Area3, 4. 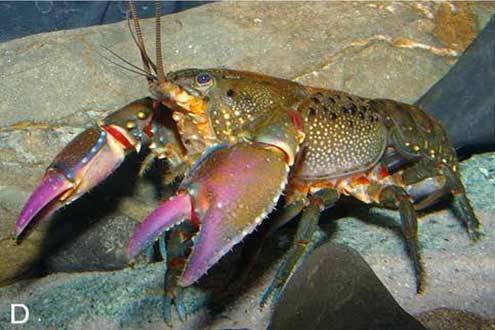 All Australian freshwater crayfish species belong to the Southern Hemisphere family, Parastacidae. Only two of these crayfish species were previously known to be indigenous to the Greater Blue Mountains5; the Giant Spiny Crayfish, Euastacus spinifer, a very spiny stream-dwelling species, and the Sydney Crayfish, Euastacus australasiensis, a smaller and less spiny burrowing species. 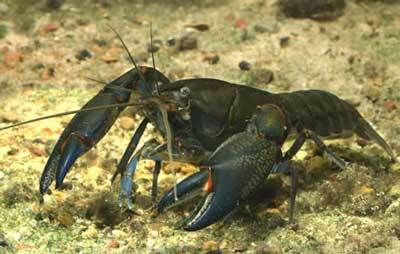 Euastacus australasiensis is unusual in that it occurs in streams and upland swamps5, 6. In upland swamps (including hanging swamps) the burrow openings of small individuals of Euastacus australasiensis can be confused with those of larvae of the endangered Giant Dragonfly, Petalura gigantea7. Both species are groundwater dependent within these upland peat swamps and reliant on access to groundwater within their burrows7. They are vulnerable to any lowering of water tables, for example, as a result of longwall coal mining, groundwater extraction or climate change8. 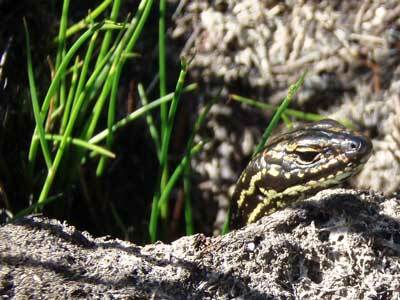 Burrows of both species are also used for refuge, during and post-fire, by other animals, including the endangered Blue Mountains Swamp Skink, Eulamprus leuraensis7, 9, 10, small frogs and invertebrates, further highlighting their important ecological roles. Burrows of Euastacus australasiensis can also frequently be seen in association with seepage along bases of moist cliff-lines in the Blue Mountains, such as along the National Pass track. 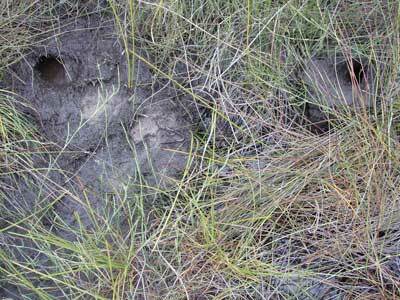 This species is clearly capable of overland movement, possibly following drainage lines during rainfall events to disperse. It is the variably orange or red crayfish which many Blue Mountains walkers will have observed in streams such as Greaves Creek along the Grand Canyon Track, although both it and Euastacus spinifer are highly variable in colour and may be variably red. The two species tend not to occur in the same stream reaches, however, with the more aggressive and more territorial Euastacus spinifer favouring larger streams or reaches with deeper pools, and Euastacus australasiensis favouring the smaller headwater reaches of streams and associated seeps when Euastacus spinifer is present downstream6. Two native species not indigenous to the Blue Mountains have also been translocated to the area. 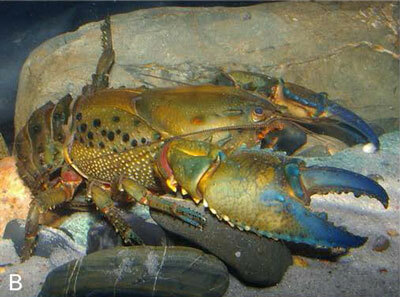 The iconic Murray Cray, Euastacus armatus, has previously been introduced into the upper Cudgegong River area, or there have at least been attempts to do so. The other native crayfish which has been introduced in the Blue Mountains is the widespread Yabby, Cherax destructor, which can be distinguished from the spiny crayfish (Euastacus species) by their smooth bodies, and claws which are smooth on the lateral or lower edge6, 11. All spiny crayfish, on the other hand, have prominent spines along the edges of their claws, as well as variably on their ‘bodies’ (cephalothorax), and particularly on their ‘tails’ (abdomen)6. The Yabby is naturally restricted to west of the Great Dividing Range in the Murray-Darling River catchment, but unfortunately, as a result of human translocations, now occurs widely in coastal drainages where it has been introduced to farm dams and coastal streams as a human food item12, 13, 14. This species should generally be treated as an introduced species in the Blue Mountains, other than perhaps in some lower elevation inland drainages west of the Great Dividing Range. This species should not be translocated in the Blue Mountains under any circumstances and should be treated as highly invasive. As a result of human translocation, primarily for aquaculture, freshwater crayfish have now established themselves outside their native ranges in many countries where they now threaten whole aquatic ecosystems, and in many cases, endangering the less competitive, locally endemic crayfish species. Globally, as a result of multiple threatening processes, a high proportion of freshwater crayfish species are now endangered, with that number expected to rise dramatically. Many species have very localised distributions and may be restricted, for example, to a single headwater stream or sub catchment. Threats include changes in land-use, drainage, pollution, harvesting, introduced species, disease, construction of dams, loss of groundwater and climate change. Ironically, where they have been introduced outside their native ranges, freshwater crayfish now also include some of the most invasive and damaging freshwater organisms in the world. Unfortunately, few Australians are aware of our rich and globally significant, freshwater crayfish fauna, and most view all freshwater crayfish generically as ‘yabbies’ or ‘crays’, greatly devaluing and underappreciating this rich diversity. Our local spiny species are well worth spending some time quietly observing as they go about their business foraging on detritus, aquatic macrophytes and algae; hunting for small aquatic animals (e.g., insect and frog larvae, juvenile crayfish); or interacting (sometimes aggressively) with their relatives in shallow streams. These animals are opportunistic omnivores. 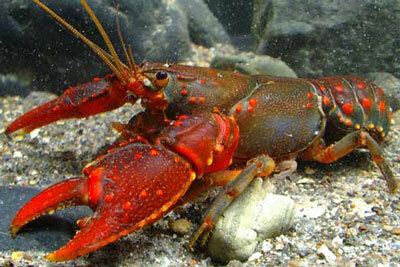 They are scavengers and predators, and when the opportunity arises, cannibals, particularly of juvenile crayfish. 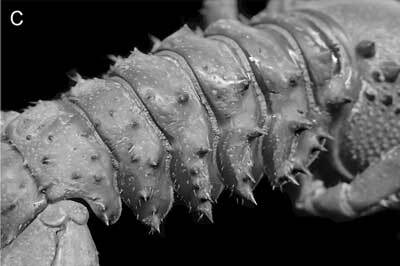 You can often find individuals of Euastacus australasiensis of all sizes, however, co-habiting in pools in streams, as this species is less aggressive and less territorial than the larger Euastacus spinifer6, 14. They are fascinating animals to study. Some species, particularly some of the burrowers, are considered ‘ecosystem engineers’, and in addition to predatory fish, eels, platypus and water rats (which all predate upon them), they may be one of the dominant aquatic predators in their ecosystems. They are long-lived animals and removing large, old individuals, particularly breeding females which can take many years (7-10 years for Euastacus australasiensis) to reach sexual maturity and live potentially for several decades afterwards6, 14, can have significant negative cascading effects on the whole stream ecosystem. The preferential removal of large males may also adversely impact populations by limiting breeding opportunities for mature females and reducing the range of sizes within their populations14. While it is technically legal to collect these spiny crayfish species under the NSW fisheries regulations (neither are listed as threatened), including unfortunately in National Parks, the minimum size limits for all Euastacus species in NSW (except the Murray Cray) is 9 cm OCL (Occipital Carapace Length; the distance between the rear of the eye socket and the end of the carapace or cephalothorax on the top); no Euastacus australasiensis and few Euastacus spinifer in the Blue Mountains would reach this minimum legal size14, 15. I strongly encourage everybody to not collect these spinies and take the opportunity to spend some time quietly observing and appreciating them in their home; in addition to being fascinating animals, they are fundamental to the health and complexity of their respective ecosystems. This article is an expanded version of an article which appeared in the Blue Mountains Conservation Society newsletter, Hut News, April 2018. We thank Robert McCormack for the use of his images.